By 1938, the Second Sino-Japanese war was not going well for the Chinese. Since July 7, 1937, the Japanese had conquered huge swathes of Northern and Eastern China and were steadily pushing deeper. With the Japanese conquest of Shanghai, Beijing, and Nanjing in 1937, Nationalist leader Jiang Jie Shi (Chang Kai Shek) moved his headquarters to Wu Han. The Japanese saw an opportunity to capture the important rail junction of Xuzhou and thereby endanger Wu Han, which could force a Chinese capitulation. The Nationalist Chinese generals, however, also saw the Japanese move as an opportunity to lure their enemy's forces into a cul-de-sac where they could be encircled by the numerically-superior Chinese forces. 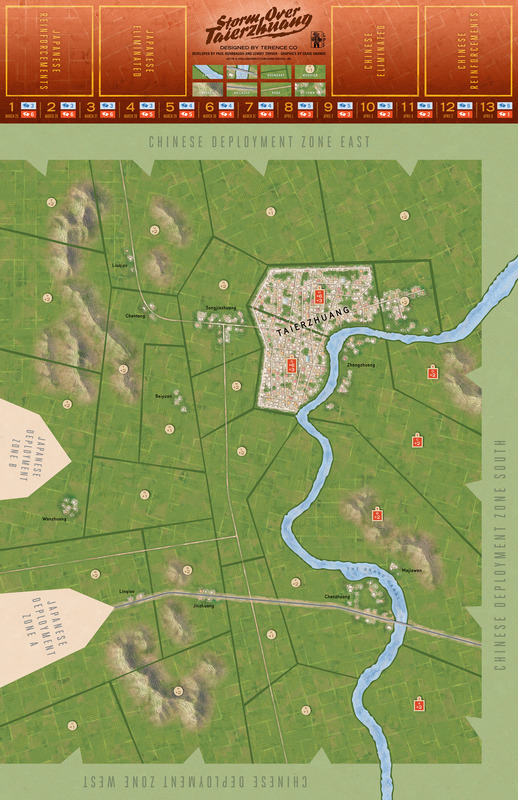 The game map covers the Taierzhuang district, which includes the walled town of Taierzhuang and its surrounding environs and villages. Units are battalion/company level representing both the Nationalist Chinese and Japanese forces. The game is played in 13 turns, each of which represents a day. The game uses an area movement/impulse action system made famous by Storm Over Arnhem, but heavily modified by a tactical chit system which is the heart of the game. There are two sets of tactical chits (Nationalist Chinese and Japanese) that represent various battlefield advantages and events. These are played by both sides to either help their attacks and defenses (or hinder those of their opponent). 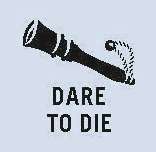 The game also contains random events and various optional rules to give a diverse range of variations to both sides' play. The game is designed to be easy to learn, re-playable and very interactive to play but still be a challenge for both sides. 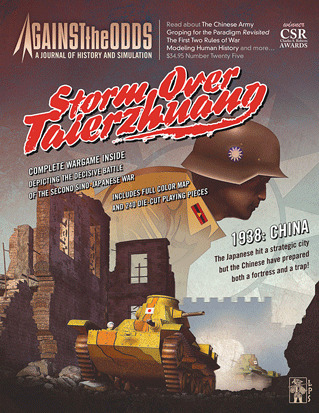 Download the Storm Over Taierzhuang rulebook (in PDF format).